"I want the listener to hear it with me at the cafe I work at ... And I want them to watch the traffic and people outside while they listen. I also want them to come in unanounced so that I dont know that it is them and that they are listening to it. Then, I want them to hang out and talk about it afterwards." 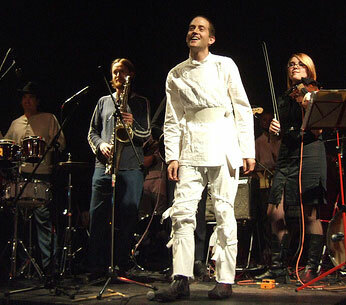 Degenerate Art Ensemble!!! Reprazent. It's pretty embarassing how everyone in Seattle desperately wants Joshua to poop on their heads just to anoint them with DAE poopy goodness. That's pretty much all I need to say about Joshua. That, and kickass monkeys ahoy!